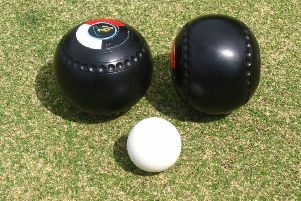 Tranent, in the Gents Pairs, turned in a brilliant performance to capture the national title in the finals of The Bowls Scotland Championships that reached its climax at The Ayr Northfield Complex yesterday. And it was a family affair with 51-year-old carpet retailer Brian (Sconie) Young skipping his 62-year-old father-in-law, Jim (Sodjur) Bonner, to the title with a battling 18-14 win over Brian Kyle and Alan Hainey of West End Stranraer. Young skipped Bonner into a 10-2 lead with a flash run of 5, 2, (2), 2, 1 but the partnership were soon being asked questions at 11-10. However, Young was confidence personified and highlighted his highly skilled contributions with an inch perfect chap and lie for a three-shot reward on end 16 to lead 18-12 going into the last. The trophy cabinet at Tranent is no stranger to housing Scottish Championship silverware as legendary East Lothian figures Graham Robertson (1987) and John McCrorie (2000) have captured the Singles crown, but this latest triumph is a first in the Pairs. Hopes of another title coming to the Lothians were dashed with a shock upset in the final of the Ladies’ Singles with three-in-a-row defending champion Lorna Smith of Linlithgow suffering a 21-13 defeat at the hands of dark horse challenger Eileen McEwan of Lanark Thistle. Smith’s smooth-flowing delivery action has been missing all week but her awesomely strong mental strength saw her through to her fourth final in a row however her best form continued to desert her and that proved fatal against an opponent whose performance was first class. “I was fishing for line and length all this week and that made me vulnerable however I was getting by until Eileen refused to buckle under pressure at 12-9 down and played immensely well to take the much coveted crown away from me,” reflected Smith. McLean produced a purple patch run of 3, 2, 3, 3 to have Smith at her 20-12 mercy then traded a single to win in 20 ends. “Life goes on,” said Smith “and I have a visit to Australia ahead of me to compete for the World Champion of Champions title” – an event she won last year in New Zealand. The Edinburgh camp were given a rare treat in the Ladies’ Singles with Betty Eaton of Beechwood enjoying a thrilling ride in into the semi-finals stage and leaving Ayr one happy lady despite the disappointing ending of making a 21-8 exit to McEwan. The ladies of Colinton also contributed to the feelgood factor of the Edinburgh camp with Sandra Slater and Cathy Stark reaching the semi-finals of The Pairs but making a 22-8 exit to Burrelton who went on to beat Kirkcowan, 13-10 in the final. Bainfield, in the Gents Fours, also carried the Edinburgh banner into the last-four stage but the rink of Stuart Clark, David McNair, Steven Pilley and Craig Paterson were always against the collar and made a 16-10 exit to West Kilbride. West Kilbride went on to capture the title with an 18-5 win over Troon Portland’s Paul Foster (skip) who, in their semi-final, ended the dreams of Linlithgow, inflicting 22-10 pain on Andy Grimshaw Jnr, Mark Graham, Davy Alexander and Gary Smith. Edinburgh’s high profile challengers in the gents’ Singles made second and third-round exits but put up bold displays with Alex Hurry piped 21-19 by 2010 champion Jonathon Ross, and Scott Macintosh dropping a three to lose a 21-18 battle with eventual champion Iain McLean. There was also disappointment in the Gents Junior Singles with Liam McKay of Tanfield crashing out 21-13 to second round opponent Connor Milne of Traves. Gents Finals: J/Singles: Alan Barrie (Kirkintilloch) 21, Paul Kane (Brock) 13; Singles: Iain McLean (Blackwod Victoria) 21, Stuart Bebbington (Ayton) 8; Pairs: Tranent 18, West End Stranraer) 14; Triples: Inverkeithing 15, Hyndland 12; Fours: West Kilbride 18, Troon Portland 5. Ladies Finals: J/Singles: Lesley Doig (Strathmiglo) 21, Michelle Keenan (Dumbarton) 19; Singles: Eileen McEwan (Lanark Thistle) 21, Lorna Smith (Linlithgow) 13; Pairs: Burrelton 13, Kirkcowan 10. Triples: Cowdenbeith 18, Scotstounhill 6; Fours: Zetland 19, West Kilbride 7.